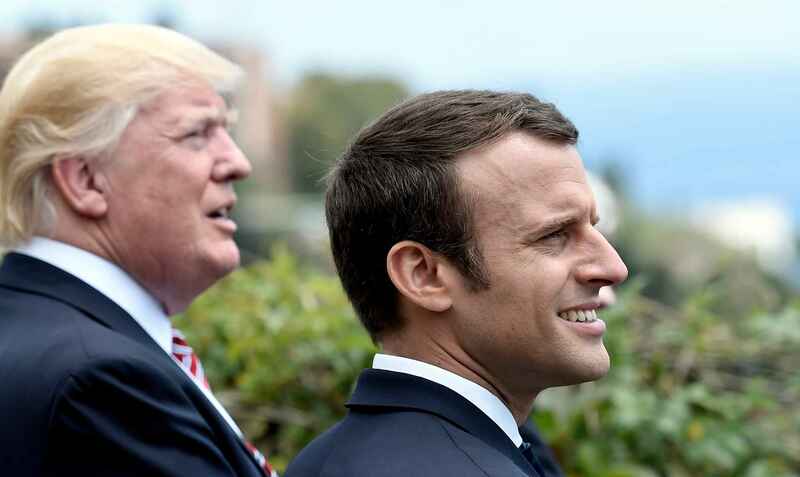 After a year in office, President Donald Trump outpolls the darling of globalism, French President Immanuel Macron. More than any other leaders on the international stage, Macron is the current representative of the supposedly inevitable, unstoppable future of globalization (forget the fledgling German Chancellor Angela Merkel; she is not even in the picture at this point, her popularity is so low.) One of my audience member sent me an article from The Guardian that takes a look at why that is. Why is it that this supposed fluke, this incompetent, unstable, reprehensible fluke who won his election only because he colluded with the Russians. How on earth can he possibly be outpolling the most stellar, brilliant, salvific star of globalization like French President Macron? How is this even humanly possible? And that of course is what the Guardian article explores. Although I do not even think that Macron was really ever that popular, he was presented as the new Tony Blair-like center-left globalist, young, virulent, who represented a hopeful cosmopolitan future. However that profile only went so far among the French population; 40 percent of them put their hopes in nationalist populism and the retraditionalism of the National Front and Marine Le Pen. Nevertheless, for the sake of argument, the Guardian is relatively honest here; it points out that the implosion of his popularity is not just worrisome to him, to Macron. It is also extremely troubling to Europe’s pro-globalization camp who in many ways have placed their hopes and dreams in Macron to effectively halt the wave of nationalist populism from sweeping the western world. In other words, after the twin shocks of Brexit and the election of Donald Trump in the United States, back to back, there was a sense that if France succumbed to this tsunami of nationalist populism, all of western Europe would fall as well. As far as the corporatist globalists are concerned, Macron cannot fail, he must succeed. And how is Macron doing? Well, Macron is currently polling, if you can believe this, Macron is currently polling lower than Francois Hollande, his extremely unpopular predecessor, at the same stage in his presidency, which of course radically contrasts with Donald Trump who is polling at a higher popularity than Obama did at this point in his presidency. You need to let that hit you. Hollande, who was one of the single most unpopular French presidents in recent memory, he was polling at a higher rate than Macron at this point. Macron wishes he had Hollande’s pathetic poll numbers. The article goes on to try to analyze why this is, why is Trump so popular in comparison to Macron. The answer is very interesting. The Guardian notes that both Trump and Macron recognize that the old western middle class was disappearing and that politics was shifting more to the rural base, the middling towns and farms and the self-employed and the once industrial heartlands of both the United States and France; this is the region where the future of democracy will be decided. We are seeing the same thing in Germany, where the once industrial heartland of West Germany, which has long been a bastion of unions loyal to the Social Democrats, are turning more and more to the nationalist populist AfD, the Alternative for Germany. But again, as the Guardian article notes, this is where the similarities between the two presidents end. Macron believed that such a demographic shift required MORE globalism; France needed to intensify its efforts to reform its economy to align more and more with this inevitable globalist economic structure. Trump believed that globalism was itself the problem, and its economic model was fundamentally contradictory and flawed. His answer was to reassert the mechanisms of national sovereignty such as economic protectionism, limits on free trade, controls on immigration and intensified border security, and spending on vast public-infrastructure-building so as to create jobs in the deindustrialized part of the United States. But then the Guardian goes on to say that the reason Trump is being embraced and Macron rejected is because of the two different kinds of voters they appeal to. While Trump appeals to heartland voters who have bought in fully with his anti-globalization platform (voters who love their nation’s culture, customs, and traditions and who want to see them celebrated and revered rather than mocked and impugned), Macron’s supporters are in many respects a contradictory lot. He has of course many in the urban area who are young, cosmopolitan and fully embrace his visions of globalization. But he has many more supporters who are older and pensioners, public workers, who have largely been shielded from the adverse effects of globalization. As urbanite public workers, representing a substantial portion of the French population, they are not particularly attracted to the nationalist populism of Marine Le Pen. BUT they are not particularly attracted to the idealistic globalization advocated by Macron either. Trump’s supporters are ALL in, as it were, they are getting what they want from Trump. Macron’s supporters are mixed bags that don’t necessarily buy into what he’s advocating, even though they preferred him to the rising nationalist populism that we are seeing particularly in the heartlands of France. The article goes on to point out the fundamental demographic problem currently being faced by Macron are those that are being faced by virtually every advocate of globalism in Europe, and I think we can add the States; the fundamental problem is that the advocates of globalization are increasingly relying on voters who are themselves products of social models and arrangements that dominated the first three decades after the second world war, and they are the ones who are quite literally dying out; they are a declining demographic in the political landscape among democratic nations in the west. However, in contrast to this, there is no indication at all that the rural voter, the basket of deplorables that Hillary Clinton described them as, these rural voters are dying away. Iindeed, the indication is that they are growing; unlike urbanites, rural folk are having children, they have a significant demographic advantage to urbanites, and they are growing in their demographic representation. So, for these globalist elites to be advocating economic policies that benefit only a small number of urbanites and metropolitans while ignoring those in the national heartlands is nothing less than political suicide. And the nationalist populist political right knows it. They are the ones who are creating this mass political realignment among rural voters who are more and more siding with the nationalist populists. This was the magic key as it were to Trump’s victory. Trump won over the rural vote at levels that were virtually unheard of. Remember, Trump won 1,700 counties out of just over 2000. The electoral victory of Trump was astounding. This is something nobody in the corporatist media wants to talk about, nobody that is except for this fellow over at the Guardian. The nationalist populist right, by evoking the fidelities of the rural vote that seek to overturn the globalist political and economic system, are positioning themselves for political dominance quite literally for generations to come. That is the politics of the future. We are seeing before our very eyes, leaders like Macron and Merkel are setting themselves and the entire globalist political economic system up for an eventual and inevitable political collapse. The Nationalist Sweden Democrats Become Biggest Party in The Nation!! !